As any long-time reader of this blog knows, I am an avid technologist. From an early age, I was coding, gaming (see this post for my personal gaming history), building computers, hacking electronic devices, etc… I’ve never been without a self-designed Internet homepage since 1997, and this blog has existed sporadically since 2002. After college I worked full-time as a web developer building applications, starting up startups, and generally being immersed in the geekiest of Internet culture (you may not know this, but according to YouTube I am a minor celebrity, because of a random video of an origami castle I posted once). I’ve salivated after iPods, stood in line for iPhones, built applications for Facebook, and co-founded two tech startups. How much more techno-centric could my life get? In recent years, despite my love of all shiny code-filled things, I’ve had a nagging worry about the largely uncritical process by which society adopts new technologies, and this has surfaced on the blog occasionally: I’ve wondered about media consumption, questioned smartphones’ effects on our mental faculties, and even stopped checking Facebook. A few years ago, a friend told me about a book by Albert Borgmann which apparently called into question the fundamental operating pattern of technology. I was intrigued, and not a bit offended by the very idea of this, so I ordered Technology and the Character of Contemporary Life (TCCL). It was my first foray into the philosophy of technology, and it profoundly changed the way I think about technology and technological devices. This change didn’t come easy; in fact, Borgmann’s rather short book took me over a year to read. Partly this is because Borgmann’s writing is dense (full of rich meaning, but hard to digest), and partly it’s because I subconsciously knew my position on technology and thereby my habitual actions were in danger of being threatened by a sea change. After finishing the book last Fall and wrestling with / processing Borgmann’s ideas, I resolved to read the book again, blogging each chapter as I go (both to clarify my own understanding and to help his ideas reach a wider audience). My goal will be to summarize Borgmann’s ideas and engage with them briefly (though this will look primarily like explicating them and defending them against putative objections, since I have been so swayed by his perspective). There are, I think, accessible popularizations of Borgmann’s ideas already available (of which I believe Shop Class as Soulcraft by Matthew Crawford to be one), but I hope my bringing attention to this relatively new field will be helpful nonetheless. For now, I will give a brief overview of the book, and hopefully tackle Chapter 1 sometime soon. 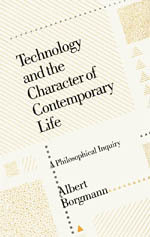 Borgmann’s book attempts to answer the basic question “What is technology?” by elucidating the basic character or pattern of technology (and indeed arguing that there is such a discernible pattern), and using that understanding to suggest a direction for the reform of technology (that such a reform is necessary is motivated by the nature of the basic pattern Borgmann argues has emerged). There are, he claims, essentially three views on the essence of technology: the substantive, the instrumentalist, and the pluralist. On the substantive view, technology is a force in its own right, with its own character, and can thereby explain other phenomena in a properly basic way. For people who hold this view, technology is often pernicious, i.e., something to be avoided or minimized (cf. the anti-technology “Luddites”). On the instrumentalist view, technology is not a thing in and of itself, beyond the facts of machines and the purposes to which humans set them. Morality vis a vis technology is therefore the same as morality vis a vis anything else—technology has no distinctive character which warrants a different analysis. Technology is essentially composed of more and better tools: there is no qualitative difference on the philosophical level between an iPhone and a hammer and chisel. Finally, the pluralist view brings to the fore the complexity of the task of describing technology, and makes no statements about its essence: it recognizes the validity in both the substantive and instrumentalist perspectives and attempts no adjudication. Borgmann is concerned in TCCL to argue for the substantive view, though in a patently non-Luddite tone. He rejects the pluralist view outright as a failure to recognize the reality that technology is something: pluralism is an unhelpful recapitulation of the problem of defining technology. The instrumentalist view is, according to Borgmann, the dominant and subconscious view, held by philosophers as well as popular culture (indeed, it was my view before reading his book), and much of the book is therefore spent explaining some of its inadequacies. His main critique is that the instrumentalist view fails to recognize the overarching paradigm which characterizes technology, and whose challenge cannot be met without engaging in so-called “deictic discourse” (essentially, discourse containing reference to ultimate goods). The whole point of instrumentalism is to avoid deictic discourse, and to assert that technology is a value-neutral enterprise, ready to be aimed towards the definition of good of whoever holds the trigger. Borgmann’s claim that in fact technology has its own “bent” brings up questions of social justice and social responsibility which end up being difficult to discuss profitably in the marketplace, especially when instrumentalism is assumed all around. The pattern Borgmann sees underlying technology as a whole is called the “device paradigm”, defined as the making of goods available in a non-burdensome way, increasingly through the removal of the inner workings of the good-producing machine from human view and from human understanding. There is therefore a distinction between a thing and a device. Wood, for example, is a thing: it is felled, chopped, stacked, and put into a fire in order to burn and produce heat for a family. While fire itself is a scientific phenomenon difficult to explain, at no point is the production of heat (for the purpose of warmth) opaque to human participants. The wood also confronts us with its thingness: it is rough, heavy, requires work to chop, turns into annoying ash, has a distinct smell, produces smoke, etc… All of these things are intrinsic and cannot be separated from the heat produced. A central heating system, on the other hand, produces warmth without any of these effects. The system itself is hidden from view (obviating the need for a hearth around which families gathered), and its workings are opaque to observers who are not specially trained in the technology. Warmth is commoditized and separated from its previously-physical concomitants. This is precisely what a device is: something that provides a commodity in a non-burdensome way, via the inner workings of black box of the machine. According to Borgmann, the commoditization of certain goods which used to be obtainable only in conjunction with certain “focal practices” (practices central to the humanity of humans, or related to “ultimate” concerns) is dangerous on a number of levels, and becomes an issue of social responsibility and justice, precisely when the instrumental view of technology illegitimates talk of ultimate concerns in the first place. What Borgmann sees happening is the increasing procurement of goods without the contexts which originally gave those goods meaning. Microwave dinners, treadmills, and the assembly line all come into view as clear examples of devices which subtly undermine the value in (respectively) the process of preparing food, the engagement of the physical world via running through it, and the satisfaction of creative, skilled labor. It should be clear at this point that Borgmann believes technology needs reform, and the last third of the book is devoted to this issue. I will stop the overview here, however, and wait to discuss his recommendations until more of the scene is set. Suffice it to say that reform for Borgmann involves a recognition of the importance of focal things and practices, an awareness of nature, and deeper reflection on excellence, happiness, work, and political involvement.